With an adjustable slide in the back of the hat; one size will fit most. In addition, all hats feature an embroidered design and are made from 100% cotton. 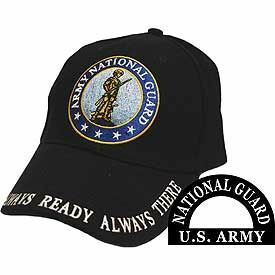 Flags International is proud to offer this Army National Guard Embroidered Hat. The hat is is black with an Army National Guard patch sewn onto the front. While on the bill, embroidered in white, is the phrase “Always Ready Always There.” Also on the back of the hat is the phrase “National Guard”With an adjustable slide in the back of the hat; one size will fit most. In addition, all hats feature an embroidered design and are made from 100% cotton. Also see our selection of other patriotic and military caps from Flags International.